Mr Monkey's shiny new coat of arms was designed for him by Susie, the human owned by his brother monkey, Squeeze, and was presented to him officially when the two monkeys met in Soho one lunchtime. The orange stripe (or bend teneé) represents his orange monkey tail; the aircraft at the top represents Mr Monkey's love of travel, and the bananas at the bottom show his close relationship with the King of Fruits. The book on which the motto is inscribed represents Mr Monkey's love of reading. The hats around the shield show Mr Monkey's love of varied headwear. The motto, Omni Res Laetus Ad Simius Sunt means All things are joyful to a monkey. 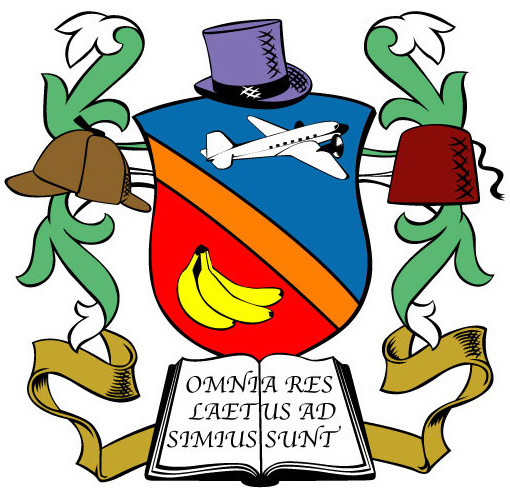 It's probably pretty unnecessary to mention that this coat of arms hasn't been granted by the Royal College of Arms, and probably never will be. The shield is blue and red, divided by an orange diagonal stripe; at the top of the shield is a Dakota aircraft, at the bottom is a bunch of bananas. The aircraft and bananas are the colours you'd expect a passenger plane and a bunch of bananas to be.